The current bubbles in financial assets -- in equities and bonds of all grades and quality -- raging in every major market across the globe are no accident. They are a deliberate creation. The intentional results of policy. Therefore, when they burst, we shouldn't regard the resulting damage as some freak act of nature or other such outcome outside of our control. To reiterate, the carnage will be the very predictable result of some terribly shortsighted decision-making and defective logic. Blame can and should be laid where it belongs: with the central banks. They were the "experts" who decided to confront the excesses of decades past (which saw borrowing running at roughly 2x the rate of real economic growth) with even easier monetary policies designed to spur even more borrowing. Rather than take stock of the simple fact that nobody can forever borrow at a faster rate than their income is growing (no matter how large that entity may be), the Fed, the ECB, the BoJ and the BoE have conveniently overlooked that simple fact and then boldly claimed that the cure is identical to the disease. If the problem is debt then the solution is even more debt. If the Fed, et al. were doctors, they would prescribe alcohol to the alcoholic. They would administer more lead to the lead-poisoned patient. They would call for more water to put in the pool where a drowning individual is floundering. The bottom line is that the Fed and its ilk made the disastrous decisions that gave us the first two burst bubbles of the new millennium. And the wonder of it all is that, instead of being met at the gates with torches and pitchforks and held to account for their errors, they have instead been granted even greater powers, less oversight, and practically zero blame. And now they’ve given us a third and, I suspect, final bubble. By which I mean I think the effects of this bursting bubble will be so horrendous that a hundred years might pass before people will again be in the mood to speculate on fantasy wealth. My hope is that, when this third bubble pops, the figurative (and, perhaps, literal?) torches and pitchforks come out. Finally forcing the central banks to answer to the public for their grievously poor decisions. And yes, the investing public also bears a portion of the responsibility for playing along with the central banks. For years, some have consoled themselves with stories about how This Time Is Different, and many have ignored many obvious warning signs as they've enjoyed stock market and bond gains fueled by seemingly limitless liquidity. But in the end, it's the central banks that set the tempo and the melody at the dance hall. When they flood the world with liquidity and set interest rates to 0%, they enforce a Hobbesian choice: either play along in the risk markets, or sit in cash earning less than nothing as inflation eats away at your purchasing power. The central banks are entirely to blame for mis-pricing money and that is the fundamental error that drives every bubble and betrays capital into hopeless investments. So let’s all remember to place blame where it is due when the bubble bursts. We shouldn't act surprised because there’s really no honor in being caught unawares by something so obvious. We’ve covered the equity bubble in the past, but today we’re going to cover the bond bubbles (yes, plural) because the current excess in the bond market is the granddaddy of them all, and is far larger than anything ever recorded in history by a very wide margin. 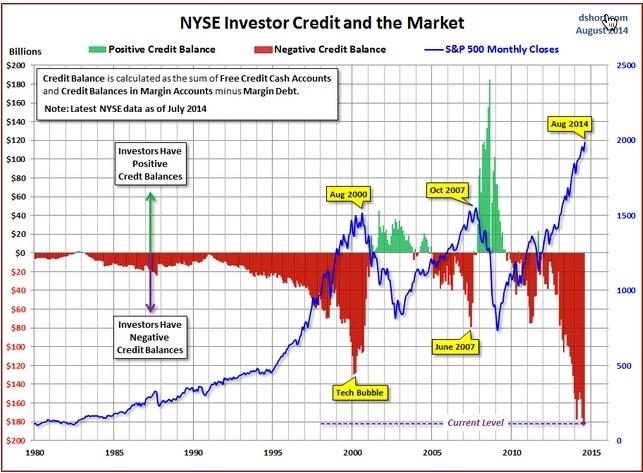 Margin debt is simply money borrowed to buy equities. Typically speaking, an average investor with $100,000 in an account can buy up to $150,000 worth of stock. Margin debt is fuel to a rising market and a lead anchor for a falling market. Yes, perhaps this time is different, or perhaps it’s exactly the same with speculators borrowing more and more as stock prices rise, sure in the knowledge that they will be smart enough to get out of the way of a falling market (this time). But, enough of material we've covered here recently. Back to bonds. When the bond bubble bursts, so much that people believe to be true will be revealed to be obvious and distressingly ordinary illusions. When there’s simply too much debt, in the period leading up to a debt bubble's bursting, everyone is counting on getting paid his or her money back, both the interest and the principal. After the bubble bursts, it’s plainly obvious that no such thing will be happening. As is always the case with bubbles (of any sort), the only important question that needs to be answered is: Who will take the losses? One simple answer to that question is: Whoever is holding the bonds when the bubble bursts. Bubbles are structured like a game of hot potato. When the timer finally dings, the person holding the potato loses. It doesn’t matter one whit whether the 'hot potato' was a tulip bulb, swamp land, a house in Las Vegas, or a paper financial security. The really striking part about the global bond markets today is that the potatoes have never been more numerous, or hotter. I suppose this would be a good time to revisit how Einstein defined insanity: trying the same thing over and over again and expecting different results. Unfortunately for those hoping for a different outcome, history is 100% consistent on the matter: Bubbles always burst. And when they do, what people thought was fabulous wealth is proven illusory, and it simply vanishes. Not that this clear historical record is keeping humans from trying to cheat the odds. Given that the Fed has engineered three increasingly larger bubbles within an unprecedentedly-short fifteen-year time span, perhaps we shouldn't persecute them. After all, they may easily be able to plead 'not guilty' by reason of insanity. $100 trillion – is that a lot? We frequently throw around big numbers in our analysis. We even try to explain them in terms that help us mentally grasp an appreciation of their enormity (watch the video How Much Is A Trillion?, as an example). But the size of the bond market across the developed world defies even our best efforts. The amount of debt globally has soared more than 40 percent to $100 trillion since the first signs of the financial crisis as governments borrowed to pull their economies out of recession and companies took advantage of record lowinterest rates, according to theBank for International Settlements. The $30 trillion increase from $70 trillion between mid-2007 and mid-2013 compares with a $3.86 trillion decline in the value ofequitiesto $53.8 trillion in the same period, according to data compiled by Bloomberg. The jump in debt as measured by the Basel,Switzerland-based BISin its quarterly review is almost twice the U.S.’sgross domestic product. So, a 42% increase in just 6 years. Did global GDP advance by 42% during this same period? No. Not even close. Did private companies borrow all that money planning to plow back into productive enterprises? Nope. Companies borrowed relatively little of $30 trillion, and even then, they mainly used that newly-borrowed money to buy back shares and/or stash it on their balance sheets. Who did borrow all that money then? Why, nations did. Sovereign entities that were desperate to keep things afloat and borrow heavily (because private concerns weren't able to take on new debt fast enough). Why? Because the world's debt pile must keep expanding. That's the world we live in today. If the pile should start to contract, the game of Who Will Take The Losses? begins. And governments know (sometimes consciously, sometimes subconsciously) that the debt bubble has become so monstrous, and so interconnected globally, that even a moderate correction will wipe out so many players that the world financial system will be brought to its knees. Or worse. In Part 2: Something Very Wicked This Way Comes, we provide great detail into why sovereign and corporate (both high-grade and junk) debt markets simply and mathematically must contract. Current prices are so historically divorced from fundamentals at this stage that this 'prediction' is about as elementary as counting on gravity to bring a tossed stone back to earth. Given the excesses of the stock and bond markets I am increasingly concerned that this next bubble burst will be far worse than any that has yet come since I've been alive. Countries will fail financially and economically, political upheaval will follow, fortunes and dreams will be shattered, and lots of people will lose their jobs. In short, lots of things will break and cease to function as the greatest wealth transfer in all of history plays out.